M. Handin & Drapkin, Furs was located in this building only briefly from around 1909 to no later than 1911 but probably only to 1910. The sign, then, very likely dates to 1909. 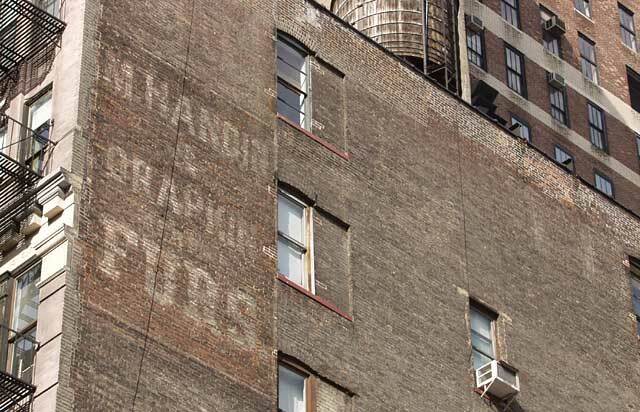 The original Handin & Drapkin was on East 10th St. around 1907/08. They were Michael Handin and Moses Drapkin. They relocated to 61 W. 15th St. from 1908 to 1909, then to the East 20th St. address above, and finally to 11 E. 22nd St. from 1911 to 1914. About this time the partners split up. Michael Handin seems to have retired, while Harry Handin (his son?) formed Handin & Co. at 11 E. 22nd St.
Moses Drapkin went on to form several more partnerships: Drapkin & Hecht, Inc. (1916-1918) with Abraham Hecht; Drapkin, Schwartzapel & Watenmaker, Inc. (1919) with Alex Schwartzapel and Louis Watenmaker; and Drapkin, Watenmaker & Steinig Inc. (1921) with Louis Watenmaker and Morris L. Steinig. Around 1924 Moses Drapkin formed Drapkin & Co. Inc., which by 1932 was run by (his three sons?) Max, Louis and Samuel Drapkin.